← Video: Armed Robbery at Goldsmith’s on Carpenter Street, Kuching. Sarawak police headquarters employee arrested. The new Opposition Pact: Pakatan Harapan. No longer Pakatan Rakyat. PAS has no right to impose conditions on Pakatan Harapan parties, said Parti Pribumi Bersatu Malaysia (Bersatu) chairperson Dr Mahathir Mohamad. “PAS has no right to place any conditions (on a member of Pakatan Harapan). “A coalition has been formed. Whoever wants to join they can (do so), and there are no conditions,” he told a press conference in Putrajaya today. The former premier was asked to comment on PAS’ plan to discuss the issue of severing ties with PKR at the Islamist party’s annual general meeting or muktamar next month. Previously, PAS’ Permatang Pauh and Bayan Baru divisions announced that they are cutting ties with PKR. Yesterday, the Harapan presidential council accepted Bersatu as a member, and agreed to Mahathir’s suggestion that the coalition be registered. The Pakatan Harapan presidential council has unanimously accepted Parti Pribumi Bersatu Malaysia (Bersatu) as a member of the opposition pact and agreed to discuss the four recommendations announced by Dr Mahathir Mohamad. “The Pakatan Harapan secretariat will be sending a letter to PPBM (Bersatu) to inform them of the decision,” read a joint statement by PKR president Dr Wan Azizah Wan Ismail, Parti Amanah Negara (Amanah) president Mohamad Sabu and DAP secretary-general Lim Guan Eng. The statement also said the presidential council, which met this morning, has agreed to register Harapan with the Registrar of Societies (ROS). Previously, Mahathir, who is Bersatu chairperson, suggested that Harapan changes its name and emphasised on the need to create a common logo, symbol and election manifesto. PKR, DAP and Parti Amanah Negara (Amanah) have decided to form a new opposition coalition, named ‘Pakatan Harapan’. This was announced by PKR president Dr Wan Azizah Wan Ismail at a press conference today after a roundtable discussion among the three parties. “The parties that attended (the roundtable discussion) have agreed to form an opposition coalition, which will be named Pakatan Harapan,” she said. PAS was invited to the discussion but it snubbed the invite. During the press conference, Wan Azizah also announced that a special committee comprising secretaries-general of each party would be formed to refine the terms of the coalition’s formation. This includes the agreement, common policy, as well as work ethics between the parties. “From today onwards, Pakatan Harapan will function fully as a political coalition to defend the rakyat and face Umno/Barisan Nasional,” said Wan Azizah. In its first move today, new opposition coalition Pakatan Harapan announced that incarcerated former opposition leader Anwar Ibrahim would be its candidate for the post of prime minister. This is, if the new coalition wins the next general election. Parliament’s Opposition Leader Dr Wan Azizah Wan Ismail in announcing this today said all three parties – PKR, DAP and Parti Amanah Negara (Amanah) – have come to consensus on this decision. “We are confident that Anwar is among the most suitable leaders to tackle the economic crisis, government’s abuse of powers as well as in ensuring the rakyat’s welfare and unity among the races,” Wan Azizah told a press conference today. 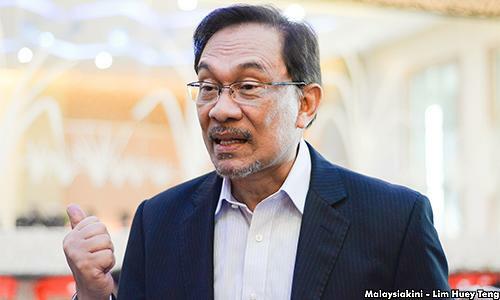 Both the DAP and Amanah had previously made clear their intention of having Anwar as the prime minister should the opposition win the next general election. This entry was posted in anwar ibrahim, April 27th tornado, DAP, Lim Kit Siang, pakatan harapan, PKR and tagged anwar ibrahim, DAP, Harapan, lim kit siang, mat sabu, Pakatan Harapan, PKR, racial profiling, wan azizah. Bookmark the permalink.